Parks Forestry and Recreation is reviewing its public tennis court operations and the Policy for Outdoor Community Tennis Club Operations. 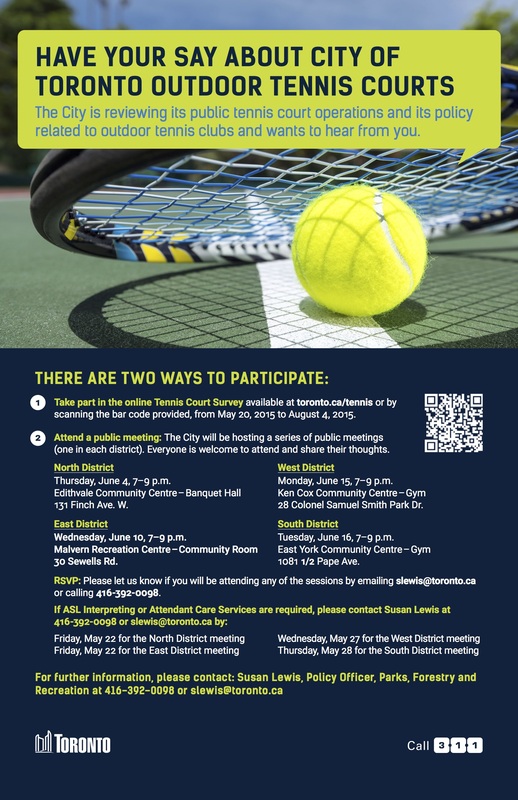 We are seeking public input through an online survey and a series of public meetings. We invite you to share the attached flyer with your members and residents. 2. PFR is hosting a series of public meetings (one in each district). Everyone is welcome to attend and share their thoughts. Thursday, June 4, 7-9 p.m.
Wednesday, June 10, 7-9 p.m.
Monday, June 15, 7-9 p.m. Please RSVP if you will be attending any of the sessions by emailing me at slewis@toronto.ca or calling 416-392-0098. RSVP is preferred but not required to attend this event. Gemini-nominated reporter Cynthia Mulligan from CityNews, who was one of the first journalists to cover this story in Toronto, will moderate a panel of leading experts and lead a Q&A period. Distinguished Senior Fellow at the Atlantic Council. Ms. Quarterman served as the Administrator of the US Department of Transportation’s Pipeline and Hazardous Materials Safety Administration (PHMSA), from 2009 until 2014. Associate Professor Faculty of Environmental Studies at York University. National Legislative Director for the Teamsters Canada Rail Conference. One of Mr. Ashley’s primary concerns is safety for the members of his union and for the public. He has spent his life as a railway worker first as a trainman, then conductor, and eventually went on to become an engineer. The Bennington annual fireworks celebration will take place on Monday May 18th at 8:30 pm in the park (adjacent to the Bennington Heights Tennis Club on Heath Street East). Donations of $20 per family would be greatly appreciated and can be dropped off in the mail boxes at 181 Bayview Heights Drive(Shelly Raftis) or at 453 Heath Street East (Kyla Bowman) by Thursday, May 14th.